If you've ever used one of Chittenden County's seven recycling drop-off centers, you've seen one of the Chittenden Solid Waste District's massive recycling containers. And you quite likely forgot about it as soon as the hulking metal mass slipped from your sight. That's about to change. The Art of Recycling Mural Project, funded by Dealer.com, is turning eight of those unsightly green receptacles into gigantic canvases for nine artists. In keeping with the earth-friendly overtones of the venture, the organizers say they're using at least 25 percent recycled paint in the process. When the containers are finished, they'll be ensconced at five CSWD drop-off centers in Burlington, Williston, Essex, Milton and Richmond. The seed of the project was planted when Mary Lacy, known for her origami-inspired murals in the Moran Plant and around Burlington, met CSWD marketing specialist Jonny Finity last summer. While she was madly trying to finish painting Dealer.com's silos before September's South End Art Hop, he stopped by to help. They got to talking about Local Color, a CSWD initiative that sells recycled house paint back to the community at a low cost. Finity pitched Lacy on the idea of painting the containers, and she immediately latched on. "When you throw something away," the artist says, "you just kind of forget about it. So [this project] brings it back into your sight. I'm super excited about art being used to bring awareness to something like this." In December, Finity and Lacy approached Jill Badolato, Dealer.com's director of social responsibility, about coming on board. Badolato was likewise instantly enthused by the project. "[Dealer] is dedicated to creating projects that strengthen the town and community," she says. Lacy assembled an impressive roster of fellow artists to tackle the eight containers, which are 22 feet long and seven-and-a-half feet tall and wide. "Part of the logistics of this is that we can only take one or two of the containers out of rotation at a time," Lacy explains. Beginning last month, the artists began to do just that, using a massive warehouse in Essex to house the operation. Lacy was the first to set brush to metal. She produced a colorfully articulated bird's-eye view of Chittenden County. 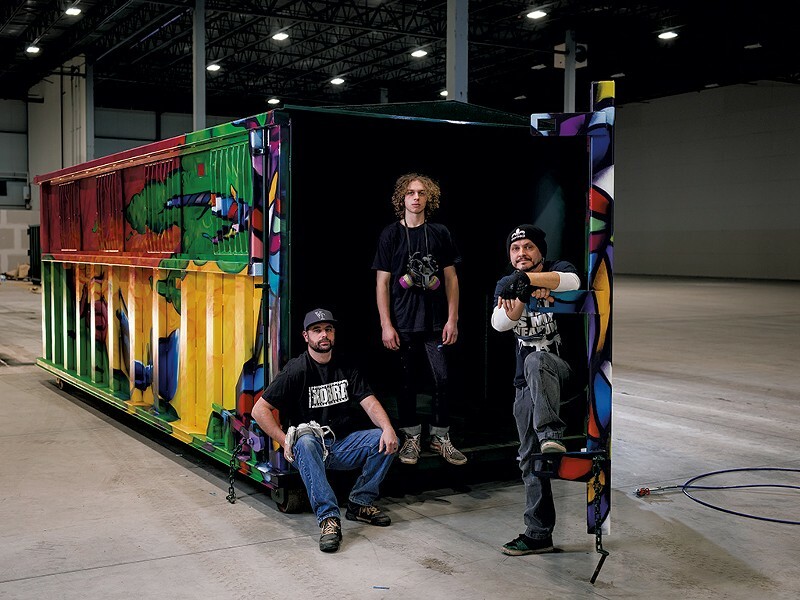 Next, Scottie Raymond, Brian Clark and Harrison Holmes of Anthill Collective covered their container with a vibrant nature scene. Their signature ants, two of which carry an empty plastic milk jug, crawl across rolling green hills punctuated by multicolored trees. Jeff Hodgdon, an artist and the chef at Revolution Kitchen, riffed on the three-arrow recycling symbol in a bright mural reminiscent of his work on the back wall of Simon's Downtown Mobil in Burlington. Sloan Collins, a Los Angeles transplant who works at the Sara Holbrook Community Center, used a cool blue palette for a heavily stylized tree. And Sarah-Lee Terrat is just getting started on her container when Seven Days stops by the warehouse. The artist, who recently completed a massive mural in the new Waterbury State Office Complex, is diving into an underwater scene that prominently features a pouty-lipped fish alongside various other lake critters. "Mary and I were talking about [this project] the other night," Terrat says, "how it's important to put art right into people's lives, so it's not this separate thing that you have to go to a gallery to see." The painting process will continue through March, with Brooklyn artist Abby Manock flying in to participate for a week at the end of February. The Vermont native, known for her strategically limited color palette and penchant for repetition, will work with a paper airplane motif. Max Hodgson, another Brooklyn-based Vermonter, will follow Manock. Finally, Wylie Sofia Garcia and Clarke Derbes will collaborate on a container that synthesizes their unique styles. The married couple has worked together before, most recently on a mural in ArtsRiot that fluidly blends Garcia's swoopy, stitch-like mark making with Derbes' characteristic geometric forms. One of the newly painted containers will participate in the 21st annual Magic Hat Mardi Gras Parade in Burlington on Saturday, March 5. With the rollout of Vermont's Universal Recycling Law (Act 148), it's a good time for CSWD to boost its public image. Finity notes that it's been challenging for haulers to get consumers on board with the new regulations. But this project is "a way of making [mandatory recycling] more exciting," he suggests. "It's a positive thing, and this idea of taking responsibility for the resources you use is a part of the Vermonters' ethic." The original print version of this article was headlined "Reuse, Recycle, Beautify"